Two Indian American scientists, Ramesh Raliya and Pratim Biswas, at Washington University in St Louis have found a sustainable way to boost agricultural production in keeping with the increasing global population, during their research on the use of nanoparticle technology in agriculture. Their epoch-making invention of an eco-friendly alternative to conventional phosphorus-rich fertilizers is expected to usher in a new age of organic farming. 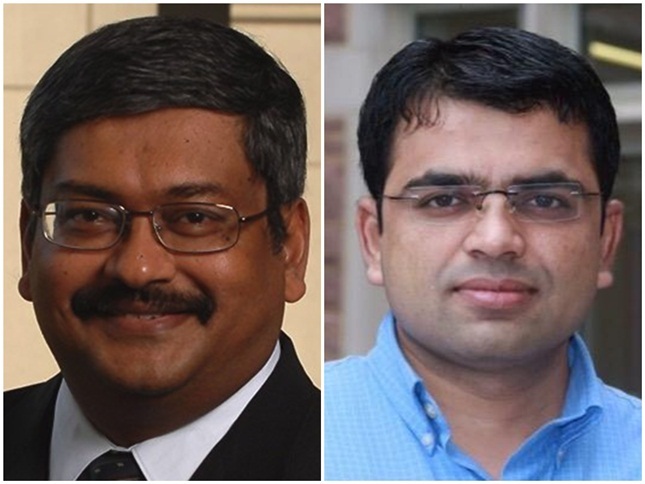 Pratim Biswas at Washington University in St Louis is a professor of environmental engineering science and Ramesh Raliya is a research scientist. Both in the School of Engineering and Applied Science discovered that the use of zinc oxide nanoparticles in farming would not only improve the growth of food crops but also save water bodies from the polluting effects of phosphorus deposits. Conventional fertilizers rich in rock phosphorus are either applied to the soil or mixed with water used for irrigation in order to nourish plants with nutrients for growth. Studies reveal that plants absorb only 42% of phosphorus from fertilizers, and the rest is drained into water bodies. Thus phosphorus builds up in water bodies and pollutes water by growing algae. Since farmers are using a plenty of phosphorus-rich fertilizer, which equals to 85% of the world’s mined phosphorus, natural phosphorus has become a limited resource and may run out of supply in the next 80 years. Published in Washington University’s Journal of Agriculture and Food Chemistry, the research by Ramesh Raliya and Pratim Biswas is the first study to highlight drawbacks of using conventional fertilizers in farming and benefits of using zinc oxide nanoparticles in fertilization of plants. Prevention of food crisis and water pollution is the greatest benefit of replacing nitrogen and phosphorus fertilizers with zinc oxide nanoparticles. Research scientist Ramesh Raliya, Pratim Biswas at Washington University in St Louis and their collaborators including Jagadish Chandra Tarafdar at Central Arid Zone Research Institute in Jodhpur, India, created zinc oxide nanoparticles from a fungus around the roots of mung bean (green gram) plants to show how it helps plants absorb nutrients from the soil in an environment-friendly way. Zinc, one of the essential nutrients for growth of plants, stimulates three enzymes to transform the complex structure of natural phosphorus into a form that plants can easily take in from the soil without any fertilizer. Extreme atmospheric conditions due to climate change make it difficult for plants to absorb phosphorus from the soil. That’s why farmers apply more and more external phosphorus to ensure sufficient growth of plants, without realizing its consequences on environment and nature. The Indian American scientist duo at Washington University aims to help farmers grow food crops without fertilizers, and that is what their successful experiment has proven. Their use of zinc oxide nanoparticles increased the green gram plants’ intake of phosphorus from the soil by 11% by stimulating the activity of three enzymes from 84% to 108%. The promising results of the experiment include a 27% increase in biomass and a 6% increase in production of beans. Professor Pratim Biswas at Washington University in St Louis says that 45% of the worldwide use of phosphorus for farming is reported in India and China. Developing countries including India and China import much of this phosphorus from the United States. If both India and China adopt this revolutionary innovation of nanoparticle technology, they will be able not only to reduce import of phosphorus but also to export surplus food, fight food crisis and contribute towards sustainability of environment at the same time. Travel Beats is a digital news portal for Indians and NRIs by IndianEagle, a leading international organization booking travel between the US and India. It publishes the latest news and stories from India and USA.